Lieutenant Brian Hugh Bridgeman Lethbridge (Bedfordshire Regiment) is killed in action at age 24. He is the son of the Reverend Bridgeman Herbert Servante Lethbridge Vicar of St Luke’s Enfield. Second Lieutenant Hugh Cecil Moxon (Bedfordshire Regiment) is killed at age 20. He is the son of the late Reverend Ernest Arthur Moxon, Vicar of All Saints New Market. Second Lieutenant John Theodore Gordon Humphreys (40th Pathans) dies while on service in Dar es Salaam at age 21. He is the son of the Reverend Henry James Humphreys Vicar of Thornley who will lose two other sons in the war. Second Lieutenant Alexander Hope Kinnear (Cameron Highlanders) is killed in action at age 22. His brother was killed in August 1916. Second Lieutenant Basil Lyoons (Berkshire Regiment) is killed at age 30. His brother was killed last September. 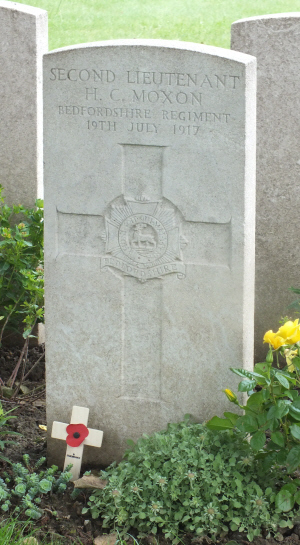 Private Frederick Turner (Cheshire Regiment) is killed at age 31. His brother died on service in February 1917.